It was just before one in the afternoon, Eastern Time, on Sept. 5, 1997, that the CBC’s online news service (then Newsworld Online, barely a year old) really realized the big difference between broadcasting — where the signal goes out to the world — and online news, where the world comes to you. If much of that world arrives at the same time, all wanting the same story, then that could overload the server, jam the system and stop those people from getting the story they want. In the early days, the small staff at Newsworld Online could tell instantly when a breaking story was attracting a huge public demand. The system slowed to a crawl. The events began early in the morning of Sunday, Aug. 31, 1997. Diana, the Princess of Wales, had died after a car crash in Paris. The story dominated the news the entire week and by Friday, this and another unrelated event almost brought the service to a halt. In 1997, with one producer, two writers and a designer, the Newsworld Online news staff could not cover the entire 24 hours. Writer Hester Riches, working alone, was just wrapping up for the day when the first news story moved that there had been an accident involving Diana in Paris. Early on the Sunday, Ken and Hester, posted the news that Diana’s death and been confirmed and then covered the return of body from France. I returned to work early from an out of town holiday on Labour Day Monday. That day’s news was the public tribute to Diana’s memory that surprised the British and world media and overwhelmed the Royal Family. The tributes and the world’s demand for that story continued to grow throughout the week. On Friday in London, the Queen, under pressure from the British public, broadcast her tribute to Diana, just after noon, Toronto time. The video feed of her speech was recorded, encoded for the website and uploaded for viewing online. 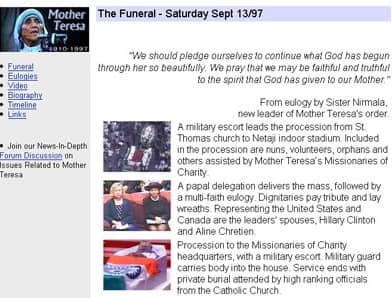 Moments later, the wire services moved a bulletin saying that Mother Teresa had just died in Calcutta. It took me less than a minute write the bare bones of that story. That turned to be the relatively easy part. Much harder was getting it out. It proved impossible for me to the load the story on the system, overloaded by the demands of Canadians watching the online video of the Queen’s speech. It took me more than 20 minutes to access the system and post the story of Mother Teresa’s death. The delay, however, did allow me to keep updating the story and write a basic obituary. With two major news stories breaking at the same time, the system was slow for the rest of the day. But this wasn’t the first time we had experienced traffic that hobbled our computer server and our ability to get the news out. That happened earlier the same year, on Feb. 18,1997, when CBC launched its pioneering coverage of the federal budget. CBC was the first news organization to send a web producer, Ken Wolff, and a designer, Robert Vajda, to the Ottawa lockup for the budget. (A “lockup” is the time when reporters, the opposition and financial institutions are given a chance to examine to a budget prior to its general release. They are all locked up in a large hall — and the information is released at the same time.) The idea was to take advantage of the power of the web to produce an entire site on the budget — and post that entire site at the moment the minister rose in the House of Commons and the information was released to the public. The news story was filed first and was posted online right away. But in an effort to give the public as much information as possible, we also decided to post the entire text of the budget on the CBC.ca site — text that wasn’t available anywhere else at the time. The demand was huge. Early visitors found that some pages loaded quickly but as people came to the site and began clicking, it took the Ottawa web team longer to file more information. But that rush for information was eclipsed by the events surrounding Diana's death later in the year. We knew that the week of tributes would culminate with another huge demand on our web service with Saturday’s funeral. The evening before, as I was about to leave, the wire services reported the complete Order of Service for the funeral. That allowed us to put up a site that let the viewers, either on the web or on television, follow the service, almost as if they were there. We then added a news story, pictures and video of the service in real time as the service continued. The other advantage of the web was that the page we created for the funeral service remained on the site for a couple of years — so people who missed it or wished to revisit it, could do so again. During the remainder of 1997 and into 1998, we expanded our staff, handled the ice storm that paralyzed eastern Ontario and Quebec that winter, and we moved from our cramped hole-in-the-wall office to a proper newsroom. When Swissair 111 crashed into the Atlantic on Sept. 2, 1998, a year after the death of Diana, we found ourselves covering a Canadian story that was attracting visitors from around the world. The breaking story was covered and the stories were uploaded. But we had learned from our experience with the huge demand after the death of Diana. Our server had been upgraded. The system held up. And so did we. Robin Rowland, web producer and photo editor for CBC News Online, was one of the first four CBC.ca staff when Newsworld Online was launched in 1996. Before that he was a lineup editor and writer for Newsworld. He is the author of four books, including King of the Mob (Viking 1987) about Canadian prohibition gangsters, and Undercover (McClelland and Stewart 1992) about RCMP undercover operations during the Prohibition era. Robin has an interdisciplinary MA in history and law from York University, a BJ from Carleton and BA in anthropology from York.